Our demanding lifestyles can be difficult for our family’s health especially our kids. Rushing to work and school are possible to make it difficult to find the right time to do an exercise. You and also your kids may be able to slip into a habit of eating unhealthy snacks and spending so much time sitting in front of TV or computer. When our kids are more prone to health issues because their immune system is not as good as ours, it will be bad for them to have unhealthy habit that may lead them to various health problems. To help you get started to assist your kids for a healthier lifestyle, here are some healthy tips for kids that you can take into account. It must be one of the difficult things to do especially if your kids are a picky eater. However, it is important that you need to be the one that decide what your kids have to eat because there is a possibility that your kids will tend to avoid nutritious food. This is because they are likely to demand junk food and chocolate cookies. You must be the one that decide which food to buy and also serve for your kids. Remember this thing: your kids will not stay hungry before going to bed. They are likely to eat what are available in the refrigerator. So, keep healthy foods only in your fridge! Kids love to have fun. As a result, you must try your best to make your kids enjoy their foods by make your kids’ food fun. In this case, you can consider add piece of fun by selecting different preparations and fillings each day. You can also try to make a simple game like asking your kids to spot dissimilar kinds of dishes, vegetables or fruits on the dining table. Many experts said that breakfast is always the most important meal of the day. As a parent, you have to encourage your kids to have a healthy breakfast. After having a good and sound night’s sleep, your kids will need to have good, healthy food that can keep them active and also concentrate at school. When you encourage your kids to have breakfast every morning, it is possible that your kids’ performance will improve too since your kids will feel less hungry until the lunch time. For the breakfast, an egg dishes or a bowl of whole-grain cereal with milk will be a good idea. 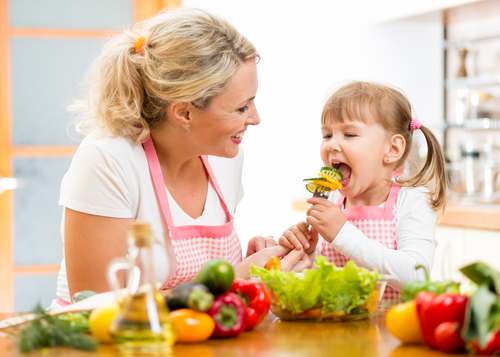 The quickest way for your kids to suffer from health issue is through eating any meal without washing their hands. This is because when your kids play or simply touch something, the bacteria or germs get transported through that thing via their hands then to the mouth. As a result, it is important for you to make them are used to wash their hands every time they have done something especially before eating. In addition, remind them to never make putting their hands on or in their mouth or even bite their nails as a habit. Another one of the healthy tips for kids is to encourage them for exercising. Developing an exercise habit starting from younger days will be a great idea. When your kids are already 5 or 6 years old, you can start to encourage them to make exercise as a habit. Of course, training exercise that is heavy is not recommended. On the other hand, you can do daily exercises for about 10-15 minutes by doing stretching and brisk walking. Other simple, but fun exercises like jumping ropes, swimming and cycling can be encouraged too when your kids still young. It is sad to say that you better teach your children not to share their lunch with anyone in the school. This is because sharing lunch is considered as the common way for germs to transfer from one thing to another. According to an expert, it is even needed to be stressed by school authorities that kids are not allowed to share lunch with other kids. There is no doubt that what you demand to your kids is actually for your kids’ own goodness. However, there is no good thing from forcing your kids. When your kids are not hungry, then you shouldn’t force them to eat more. You shouldn’t bribe your kids by giving them particular foods just to encourage them to clear their plate. This kind of habit will only make your kids frustrated or just make them struggle for only finishing their foods. Instead, you may need to serve small portion for them and allow them to ask independently for more when they want. This is another significant issue for children. For your information, it is highly important for your kids to have minimally 10 to 11 hours of good night’s sleep. When your kids do not get adequate sleep they need, there is a high opportunity that they will doze off when they are studying at school and then they will come home irritated and exhausted. You can help your kids to have a regular sleeping pattern by make sure that your kids go to bed and wake up at the same time every day. Then, make sure that your kids enjoy some quiet time without TV before bedtime. Those are a few healthy tips for kids that you can start to practice now with your kids. The last but not least, make sure that you bring your kids to visit pediatrician and also dentist in regular basis to make sure that their health is always monitored well by professional. More importantly, it will help you to keep them away from big problems in the future. 1 Response to "Healthy Tips for Kids as the Experts Said"